Now, I’m not sure whether this is “exactly” what he said, but it’s something like that. Nonetheless, it’s jarring, it’s counter-culture, and it’s exactly right – especially if what you have to accomplish involves any creativity, innovation, or synergy. However, in our “go-go” society, where we need to be immediately reachable via Twitter, Facebook, email, text messaging and the like, and where many people pride themselves on their ability to multitask, the very notion of meditation (at all, much less for one or two hours!) is unthinkable. We keep pushing. We keep going. Until… Well, we stop. We either shut down, tune out, fall apart, or go on an extended mental vacation. Or worse. And, as we keep the pedal to the metal, our productivity, our creativity, and our ability to innovate spirals downward rapidly. The irony is this – the more we push to be creative, the less successful we are. Like my golf swing. The more I press, the more time I spend in the weeds. So… There is a different answer – available now – and the sales person was a small, quiet, non-threatening Indian man who accomplished a few innovative things in his life. Like – ending the centuries-long occupation of his country – all without firing a single shot, dropping a single bomb, or taking a single hostage. ONE: Spend time getting clear about the “real” issue you’re wanting to solve. Is it about being more peaceful or less anxious? More creative or more productive? Take some time here – and then just put the “issue” out to the universe and ask for an answer. Don’t create an answer, just ask. TWO: Ban talk radio from your car. Listen to relaxing music if you must (I like total silence most of the time), but absolutely no talk radio. Why? The things on talk radio aren’t about calmness, serenity, or peace. It’s about anger, being offended, and fear (plus about 1,000,000 other negative energy stuff). Just shut it off. THREE: Schedule 50 minute meetings instead of 60 minute meetings. Why? We can ALWAYS get everything done in 50 minutes for which we schedule 60 (just be a little more efficient), and that gives us 10 minutes to recharge between meetings. How many days do you run from one meeting to the next – and wind up totally drained by the end of the day? Find 10 minutes of quiet – and you’ve just opened up a chance to reflect, reset, and to pee. FOUR: Unless you’re on call for a HUGE deal (or your 13 year old who’s at summer camp), put your cell phone in your glove compartment and lock it when you’re driving. Really. That’s what voice mail is for – and by having your phone unreachable by you, the temptation to just “look” at your email and text messages (or worse) will be ended. Plus – you’ve just now added 30-60 seconds of quiet at every stop light (provided of course you’re following tip number two above). FIVE: Then – if you’re ready for some very productive quiet time, take 5 minutes at the start and end of your day and sit in stillness. No list making, no pro/con analysis, no problem solving, just sit. To get myself quiet this way, I like to use the visual metaphor of being a conductor who has just walked into a busy, crowded concert hall. I then stand at the podium, tap my baton, and wait for the audience to settle. It’s then that I’m in a moment of quiet. If the audience (my internal dialog) interrupts, I just quietly tap the baton and do it all over again. I actually do this about 10 times a day, and that’s how I get my hour (or so) of meditation in. It works! 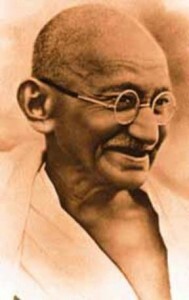 Anyway, thankfully none of us have the same level of stress and challenge that faced Gandhi in his time – but we do have exactly the same tools available to us to help us create power-filled, positive, innovative answers. We can leverage quiet in the midst of chaos! Quiet. Stillness. And the resulting “Aha!” moments that flow . . . are, well, extraordinary. Here’s a “Video Version” of this post (sort of…). It’s one of my “Live Unstuck” messages. CLICK HERE to see all of my Live Unstuck messages.